Requirement: Find all large files in SharePoint Online site collection. How to Find Large Files in SharePoint Online? 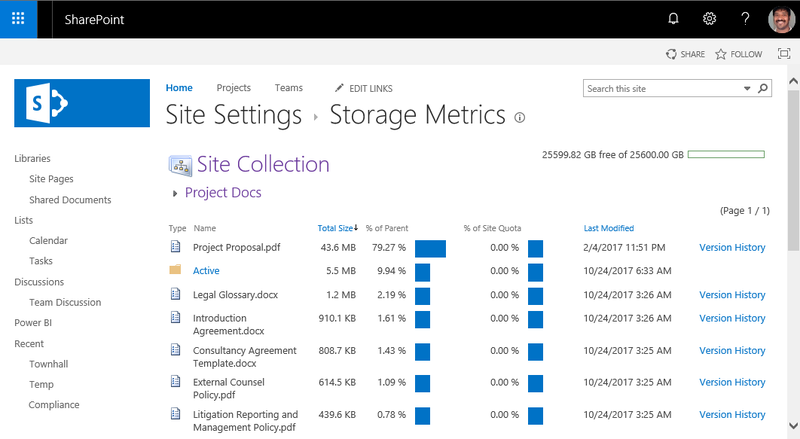 To find large files in SharePoint Online, you can use "Storage Metrics" page. The Storage Metrics page gives you the current Storage consumption of the site. You can navigate to each site/folder objects to get the storage stats of the particular object. You can also include the OOTB "File Size" column in your document library views to get the size of individual files! Explorer view also helps!! Getting large files by navigating into each folder from the above Storage metrics page is cumbersome, So lets use PowerShell to fetch all larger files in a SharePoint Online site collection. Write-host -f Yellow "Processing Folder: $($SiteCollURL)$($Folder.ServerRelativeURL)"
Write-host -f Green "Found a File '$($File.Name)' with Size $([math]::Round($File.Length/1MB))MB"
This script gets you the list of all files which are larger than 50MB into a CSV file with "File Name", "File URL" and "Size in MB" columns! This was very useful, Thanks! !